Dr. Casey Gruber his wife Dominique and their team are thrilled to announce we are opening our new facility located at 15 Two Willow Lane, Red Lodge, MT (previously the home of Red Lodge Surveying). Just 1/2 mile from our current location. We are so thankful for the support from the community and everyone that has helped make this dream come true. Our new facility will provide us the much needed space to continue to practice high-quality mixed animal medicine, in an easy to access location within Red Lodge. The main building will have 2 exam rooms for you and your pets’ comfort, along with ample space for in-house surgeries, diagnostics and treatments. The equine treatment and examination facility will be connected directly to our hospitalized equine patient barn and bovine facility, allowing us to closely monitor our equine and bovine critical care patients while we continue with our daily in-clinic visits. We will no longer be providing small animal non-clinical boarding services at our new location. We apologize for the inconvenience. We have outgrown our current location! Your pets’ health is our number one priority. If you have purchased any of the recalled food on the list from us, please give us a call for a full refund. If you have purchased any of the food on the list from a different company, please follow the instructions provided to learn how to get the affected food taken care of. The following link will also demonstrate how to read the sku numbers to see if the food you have is affected. The team at Red Lodge Veterinary Clinic. 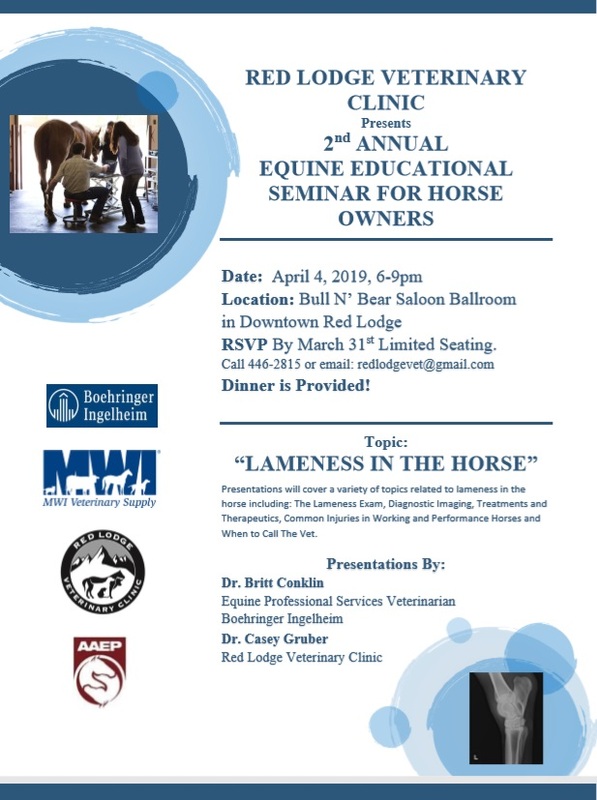 Dr. Casey Gruber and Red Lodge Veterinary Clinic are thrilled to offer our 2nd annual educational seminar for horse owners. This time around we will be focusing on equine lameness. Specific topics include diagnosis, treatment options, common injuries in working and performance horses and ‘when to call the vet’. We are excited to present our guest speaker Dr. Britt Conklin. He is an equine professional services veterinarian with Boehringer Ingelheim Vetmedica, Inc. He earned his undergraduate degree from Texas Tech University, which inducted him into its hall of fame. Upon graduation from veterinary school at Texas A&M, he worked at a large equine referral practice in Weatherford, Texas. More recently he was a practicing veterinarian and owner at Reata Equine Hospital. Conklin has an expertise in dealing with lameness in performance horses, as well as podiatry, and spends his time helping horse owners and veterinarians care for performance horses. He’s a member of the American Association of Equine Practitioners, American Farrier’s Association, and the Texas Equine Veterinary Association. RSVP quickly as we filled every slot last year! 406-446-2815 or redlodgevet@gmail.com. Horses with dental problems may show obvious signs, such as pain or irritation, or they may show no noticeable signs at all. This is because some horses simply adapt to their discomfort. For this reason, periodic dental examinations performed by your equine veterinarian are essential to your horse’s health. It is important to catch dental problems early. If a horse starts behaving abnormally, dental problems should be considered as a potential cause. Waiting too long may increase the difficulty of remedying certain conditions or may even make remedy impossible. Loss of feed from mouth while eating, difficulty with chewing, or excessive salivation. Large or undigested feed particles (long stems or whole grain) in manure. Head tilting or tossing, bit chewing, tongue lolling, fighting the bit, or resisting bridling. Poor performance, such as lugging on the bridle, failing to turn or stop, even bucking. Foul odor from mouth or nostrils, or traces of blood from the mouth. Nasal discharge or swelling of the face, jaw or mouth tissues. Oral exams should be an essential part of an annual physical examination by your veterinarian. Every dental exam provides the opportunity to perform routine preventative dental maintenance. Mature horses should get a thorough dental exam at least once a year, and horses 2 –5 years old should be examined twice yearly. Learn more about proper dental care at www.aaep.org/horse-owner. What’s New? All sexually intact female cattle and domestic bison 12 months of age or older are required to be vaccinated against brucellosis (Bangs vaccine). This is an expansion of previous vaccination requirements that applied only to female cattle and domestic bison in the Designated Surveillance Area (DSA). Who Does It Apply To? Cattle and domestic bison producers in the following counties: Carbon, Stillwater, Sweet Grass, Big Horn, Park, Beaverhead, Gallatin, Jefferson and Madison. The new ruling also includes cattle that enter any of these counties for seasonal grazing. Who Does It Not Apply To? Spayed female cattle or adult cows previously Bangs vaccinated as heifers between 4-12 months of age. When Does the New Rule Occur? The new vaccination requirements go into effect immediately. When Is the Best Time to Bangs Vaccinate? Bangs vaccinating heifers 4-12 months of age is the ideal time to vaccinate. For adult cattle, Red Lodge Veterinary Clinic recommends that vaccination occur in non-pregnant or post-calving cows and bison. Bangs vaccination in pregnant animals may result in pregnancy loss and abortion. Do Adult Female Cattle and Bison Not Leaving the Property Apply to This Rule? Yes, the rule applies to all sexually intact female cattle and domestic bison 12 months of age or older in Carbon, Stillwater, Sweet Grass, Park, Gallatin, Jefferson and Madison counties regardless of production type and practices. Will the New Ruling Be Enforced? Yes, but to what extent is unclear at this time. Brand inspections, interstate veterinary health certificates and sales barns are all likely areas that will ask for proof of Bangs vaccination. What Is the Cost? Red Lodge Veterinary Clinic will charge the same cost as current Bangs vaccination fees in heifers. Why Is There New Requirements? The Montana Department of Livestock (MDOL) continues to monitor the prevalence of brucellosis in the Greater Yellowstone Region. This new ruling was implemented in an effort to prevent and reduce disease and protect the livestock industry in Montana. On February 7th, 2018 we held a horse owners’ seminar related to PPID (formerly known as Cushing’s Disease). Pituitary Pars Intermedia Dysfunction (PPID) causes the horse’s pituitary gland to work overtime, causing a variety of problems. Please check out the following link to view Boehringer Ingelheim’s website with details on how to identify early and advanced signs and what you can do about it. 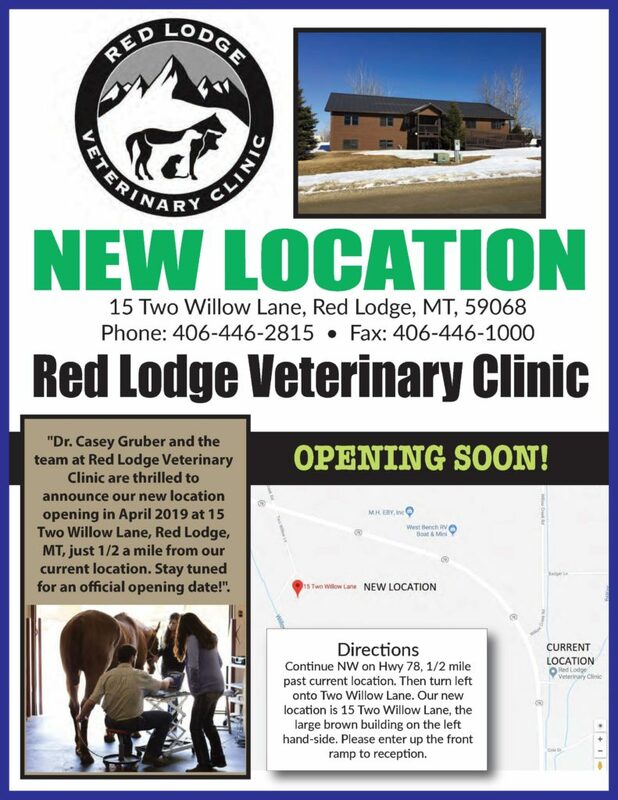 The veterinary team and staff at Red Lodge Veterinary Clinic are excited to welcome Dr. Casey Gruber to the practice. Dr. Casey Gruber grew up near Joliet, MT and became interested in veterinary medicine at an early age. He competed in both high school and intercollegiate rodeo while growing up. He received his undergraduate degree at Montana State University in 2003 and his doctorate of veterinary degree (DVM) at Colorado State University in 2008. He next completed an internship in equine medicine at Pioneer Equine Hospital in Oakdale, CA. Following completion of his internship, Dr. Gruber moved to Calgary, Alberta and worked as an associate veterinarian at Moore Equine Veterinary Centre for 6 years. While in Calgary, Dr. Gruber served as adjunct clinical instructor at the University of Calgary, School of Veterinary Medicine, teaching clinical rotations to senior veterinary students. He has attended to horses competing at the Spruce Meadows tournaments and Calgary Stampede. He has also worked in past winters at the Winter Equestrian Festival and Global Dressage competitions in Wellington, FL. Dr. Gruber holds a special interest in performance horse medicine including lameness and podiatry. In addition, to a large portion of his career devoted to equine medicine, Dr. Gruber has also worked consistently with cattle. He served as facility veterinarian at Alta Genetics in addition to providing service at Calgary area ranches for 6 years. He will also be expanding his services to include small animal medicine here in Red Lodge. Dr. Gruber, his wife Dominique and their baby boy Jack, look forward to joining the Red Lodge community and working with Dr. Beug at Red Lodge Veterinary Clinic. With the addition of Dr. Gruber we are expanding our services to include after-hours emergency care for large animals and mobile ambulatory service in the greater Red Lodge area. With these new changes and expansion of staff we will be able to continue to provide the latest in quality veterinary care for both pets and livestock. We thank you for your loyalty and patronage over the last 40 years. Be sure to check our Facebook page for further updates. We are excited to offer Stemlogix Stem Cell Therapy for osteoarthritis, tendon, and ligament repair for both Equine and Canine patients. We use adipose (fat) derived stem cells that are easily harvested from the patient by a simple, minimally invasive, scar-free, liposuction procedure. The sample is then processed on site and the fresh stem cells are immediately injected into the joint, ligament, or tendon. The whole procedure takes approximately 3-4 hours. This eliminates the need for shipping to a lab, time delay, and tissue culturing. We have tested 6 cases at this time and are very impressed with the results. Dr. Ellis Farstvedt has modified the surgical technique for pastern arthrodesis (fuzzing of a joint) in horses with advanced ringbone in the pastern. The surgical procedure is much more minimally invasive than the traditional procedure. 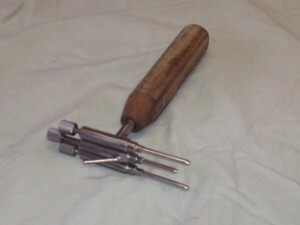 Dr. John Beug invented a drill guide that shortens surgery time by half. This procedure greatly reduces anesthesia time, down time, patient discomfort, and cost. With sunshine and melting snow comes fresh green grass pastures. While green grass is highly nutritious and a favorite of our horses, it is not without its perils. Green grass has a very high sugar content and is highly fermentable when undergoing digestion. This means that it produces a lot of gas and can cause subsequent diarrhea, abdominal pain and cramping in the horse. Signs of colic (belly pain) are stretching, pawing, looking at sides, posturing to urinate without actually urinating and rolling on the ground. If you see these signs, call your veterinarian immediately. Many grass colics can be treated easily and without much expense if they are recognized early enough. Green, growing grass stores high levels of sugar that can cause inflammation and pain in the hoof lamina. In spring pastures, sugar content is highest in the late afternoon and early evening. Horses who have been on hay or dry brown pasture all winter should be gradually re-introduced to green grass in order to prevent sugar overload and inflammation of the hoof lamina resulting in laminitis (“grass founder”). We recommend turning horses out on green grass for 2-3 hours in the morning for the first week. After this, grazing time can be increased 2 hours a day each week until the horse is turned out 6-8 hours a day. It is important to note that not only over-weight or cresty necked horses can get grass induced laminitis. It can happen to any horse. Signs of grass induced laminitis/founder are reluctance to walk, lameness, “tip toeing” in front feet, standing with a rocked-back on hind limb posture in an effort to take weight off front feet. Most of these horses are VERY lame on gravel or hard surfaces and slightly less lame in pasture or soft footing. If you see these signs, call your veterinarian immediately. It’s a beautiful sunny spring afternoon, the snow is finally melting and it’s warm enough to go riding without so many layers that you can’t get on your horse. You sneak out of work an hour early and make a beeline for the pasture to catch your horse. As you approach the gate you can see that something is wrong. “Lucky” is not standing at the gate to meet you as usual, instead he is in the middle of the pasture, head down and blood gushing from a wound on his leg. This is an unfortunately common scenario. Horses are accident prone animals. Emergencies ranging from lacerations and wounds to episodes of colic are quite common and often times require immediate emergency veterinary care to create the most promising outcome. Below are a few helpful tips and pieces of information that will greatly help your veterinarian assess the situation and guide you through the steps of getting the horse safely and quickly to the veterinary clinic. Stop bleeding – cover the wound with baby diapers, bandage wraps, gauze or towels. Secure in place with vet wrap or duct tape. Even if bandages soak through quickly, don’t remove them; simply add more bandage over top. Do not move the horse more than is absolutely necessary- try to get a horse trailer as close to the horse as possible. If the horse has to walk, make sure that the wound is covered as best as possible to avoid dirt and debris. Flip the horses lip up and press your finger to the gum just above the front teeth. The gum should be a pale pink and moist. When you press, the gum should blanch to white and return to pink in less than 2 seconds. Heart Rate – use your stethoscope or place your hand over the left chest wall just behind the horses elbow. Count heart beats for 15 seconds and multiply by 4 to get beats per minute. Normal for a horse is 36-48 heart beats in a minute. Gut sounds (only important if you think the horse is colicking)- if you have a stethoscope listen for digestion (toilet flushing sounds) on either side of the horses belly and along the back between the horses ribs and flank. You should be able to quickly and easily hear sounds. Now, call the veterinarian and explain to them what is going on with the horse. Your vet will be very appreciative of the above information and have a clearer picture of the level of emergency. S/he will ask you several more questions and formulate a safe next step treatment plan for you and your horse.